LOCATION The research was conducted on the Mountain Horticultural Crops Research Station in Fletcher, NC. New ramps farmers are located mostly in western North Carolina, although we know of a few in the Raleigh area. There are at least forty new ramps growers in North Carolina. At this time, we only know of one group of producers making an income from their ramps. These are the members of the Smoky Mountain Native Plants Association in Robbinsville. They make a cornmeal mix using the leaves of the ramps, so they are able to harvest from plantings too small to dig for bulbs. Preliminary enterprise budgets indicate that growers could expect net returns of around $7,700 per acre after three years. INTRODUCTION: Ramps (Allium tricoccum L.), also known as wild leeks, are increasing in popularity, particularly as a specialty, gourmet food. Traditionally, ramps were harvested from the forest in the early spring and consumed as a spring tonic. This tradition evolved into the many spring ramp festivals that are now held throughout the Appalachian mountains. 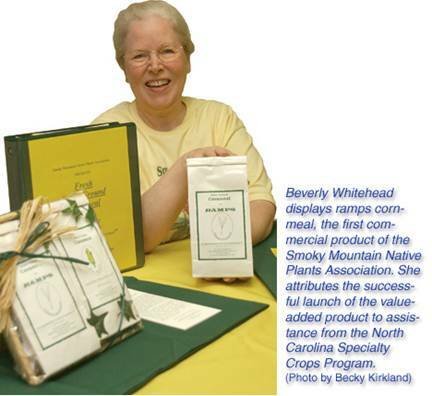 In western North Carolina, Waynesville, Robbinsville, and Sylva are just a few of the communities that host annual ramps festivals. The rising interest in ramps, however, is threatening their very existence since almost all of the ramps consumed are still wild-harvested from local forests. In effort to conserve wild ramps populations, while at the same time creating an economic opportunity for mountain growers, we have been working at developing a commercial cultivation system for ramps. 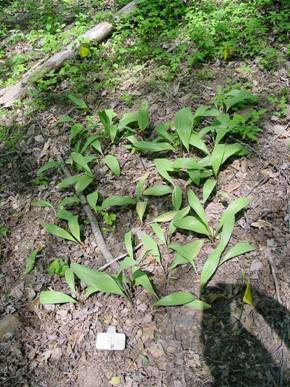 In March 2001 a study was initiated in the woods at the Mountain Horticultural Crops Research Station in Fletcher, NC to examine the influence of soil pH and soil calcium levels on survival, growth, reproduction, and bulb yields of ramps. Four pH (4.9, 5.5, 6.0, and 6.5) x 4 calcium treatments (0, 1000, 3000, and 5000 lb. Ca/acre) were established. Ramp bulbs were planted and mulched with leaf litter. Data are being collected on plant emergence, survival, vigor, foliage color, flowering, and decline. To determine the best time to plant ramp bulbs, spring versus fall planting is also being evaluated in the woods at the Mountain Horticultural Crops Research Station in Fletcher, NC. Ramp bulbs were planted in March 2001 and October 2001 and mulched with leaf litter. Data are being collected on emergence, survival, growth, flowering, and decline. This was the third year of growth for these ramp plants. No additional soil amendments have been made. Plant survival and growth were greatly influenced by the soil pH and calcium treatments. The highest survival rates, over 50%, were in the soils with the lowest pH and highest calcium treatments. The lowest survival rates, 10% or less, were in the two highest pH treatments, but there was no clear calcium effect. Ramps tend to flower every other year and 2004 was a year with few flowers. Interestingly, out of 50 plots, only two had flowers. One had one flower and the other had 26. the plot with 26 flowers was the lowest soil pH with the lowest calcium treatment. This was the third year of growth for these ramp plants. As has been observed since the first year, the fall planted bulbs continue to maintain the highest plant survival rates. Eighty-one percent of the fall planted bulbs emerged this year compared to 63% of the spring planted bulbs. The plants looked very healthy but had not filled in the plots enough to make a bulb harvest economically feasible. Final results and recommendations from these studies will not be available until these plots are harvested, which will be several more years yet. In the meantime, all observations are based on what we see happening with leaves, flowers, and fruit. Based on the plant survival and leaf growth observed over three years, it appears that ramps grow best in an acidic soil with moderate to high levels of calcium.